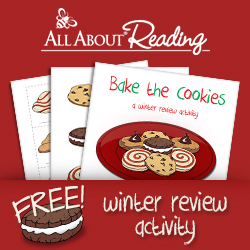 I am so excited to be able to host my first product review and giveaway. In my searches for products that are Made in the USA, I came across Beastly Buddies. Ann is the owner of Beastly Buddies and she is the sweetest person. I contacted her for permission to add her to the Shop page since her products are Made in the USA - Schenectady, NY actually. She was kind enough to offer me the opportunity to review two of her costumes. Each costume is handmade by Ann herself. Ann has been making costumes for about 20 years and from time to time still sees some from times gone by for sale on the internet. 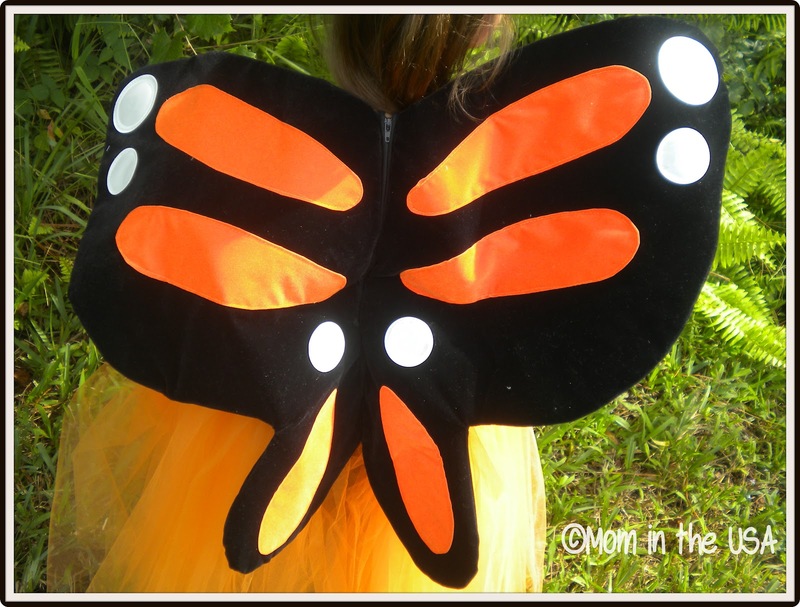 The first costume is for a Monarch Butterfly costume. When Lyla saw me take this costume out of the package, the princess in her came flying out. She wanted her princess dress right away....so I put it on her. The costume slips on very easily. Picture this: I have an enthusiastic 3-year old who wants the costume on now and a one-year old who kept trying to hide in the tulle. I still had an easy time getting it on. It is one piece that slips on. (Note: The Halloween bag in the picture is not included. We already owned it.) The black bodice is lycra and it is a bodysuit so there is a bottom part for your little lady. I added a pair of black leggings underneath so it wouldn't be see-through. I think that might just be personal preference also. The wings are quite impressive. They are made of flock and Lyla loved how soft they were. 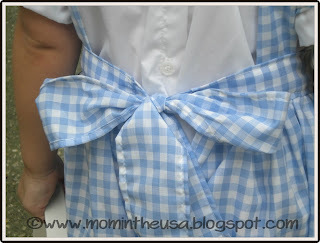 We also found out that it's easy to wipe off little oopsies from the bodice. A baby wipe cleaned it right up. The costume is dry clean only. The dots on the wings glow in the dark. They just have to be "charged" with a light source. (Note: Don't hold it up to something hot. It might burn.) Lyla is 3 and this is a size 4. On a hard surface, the costume goes down to her ankles. She meandered through the grass and had no problems walking. 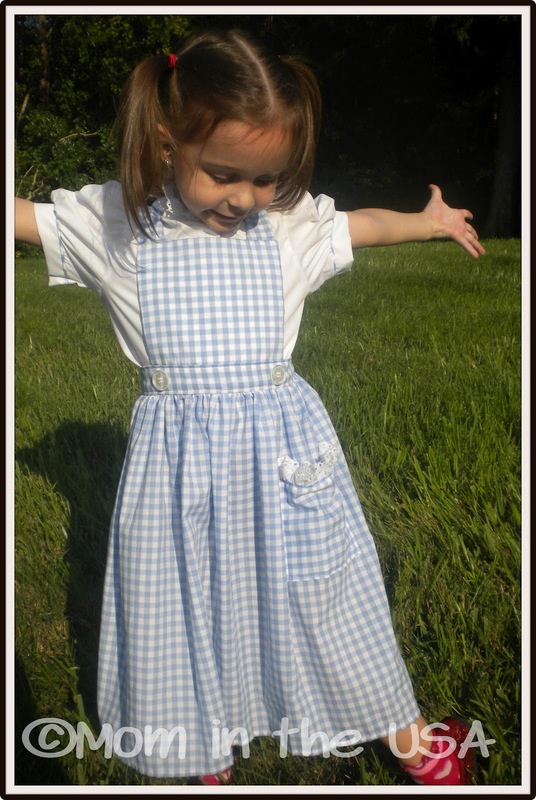 The costumes are available in sizes 2, 4, 6, 8, 10, and 12. The bad part of this costume: It was not easy to convince Lyla to actually remove it! The only reason that I convinced her to take off the costume was because either she had the other costume to twirl in or it was time to eat and she didn't want to accidentally spill something on her costume. I have to admit I learned a lesson. I had forgotten how much little girls love dress-up. I did not expect Lyla to wear this costume as much as she has since she received it. Amateur mommy! I love watching that thrill in my daughter's eyes. The second costume that I was given to review was a costume of Dorothy from the Wizard of Oz, also in a size 4. Lyla loved this costume also. She must have because she never wants anything in her hair. To take these pictures, she let me put pig tails in her hair. She also exercised her own fashion sense with the socks. This costume includes the white blouse and blue and white gingham apron dress (2 pieces). We happened to have the red "ruby" slippers. The costume is available in sizes 12 months and 18 months. This costume can survive Halloween night and many more "dress-up" days to come. While we were taking these pictures, Lyla decided to run on the sidewalk, pictured above, and she fell. I thought the dress would get snagged or something. I am proud to inform you that the dress survived the fall without a hitch. Lyla's poor little knee didn't do quite as well. Little boo-boo, big mommy kisses and a band-aid - her knee will be just fine. I was concerned about the opening where the bow goes in the back, but as you can see from the picture, you can't even tell. Lyla has twirled in this dress while holding her basket and has enjoyed it so much. 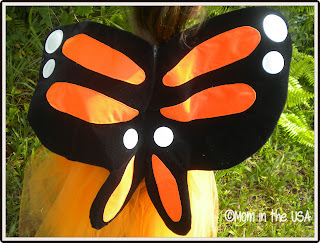 GIVEAWAY: This is a giveaway for one Monarch Butterfly costume pictured below. 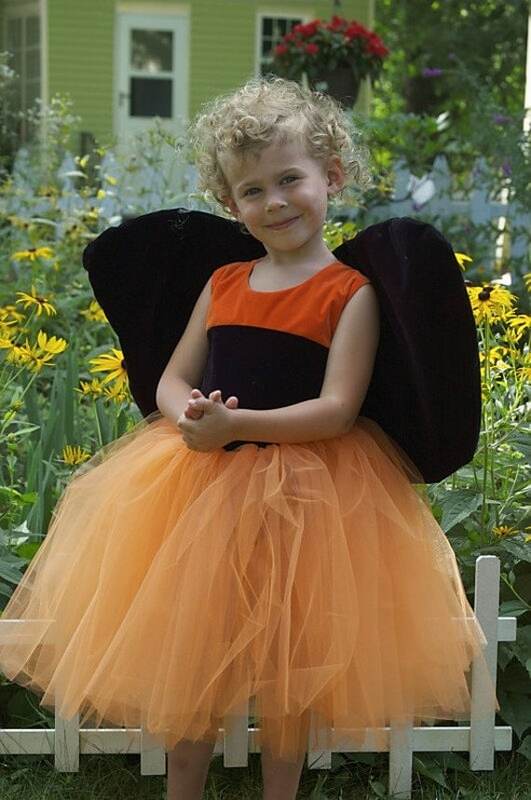 The costume is available in sizes 2, 4, 6, 8, 10, and 12 so you can pick one of these sizes if you are the winner. Enter by using the Rafflecopter form below for a chance to win this awesome costume! Please let me know if you have any questions. Open to the US, ages 18+. 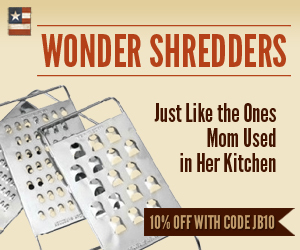 I was provided with a product to review, and I have provided my honest opinion as a mother. Thank you to the sponsoring company for working with Mom in the USA. You can view my complete PR policies here. I am disclosing this in accordance with the Federal Trade Commissions 16 CFR, Part 255 Guides Concerning the Use of Endorsements and Testimonials in Advertising. Hi Rebecca, thank you for stopping by. The Snow White costume looks fantastic. Hi, Tori. Thank you for stopping by. The Sleeping Beauty costume is such a classic and another great costume. That's a great costume. What little princess wouldn't enjoy this? Says your email isn't set up for subscription by email. I'd love to see items from 3D Laser Gifts on the list. Gorgeous items. Thank you for letting me know about the email issue. I'm sorry you had an issue with it. I am looking into it and will fix it. As for the 3D Laser Gifts, I will search for them and let you know when I find it. Thank you for the great feedback. Hi. Thank you for stopping by. The Frog costume is adorable. Lyla loves frogs (the stuffed ones). I wish I would have known about that costume for her first birthday. We did it as a frog theme because she had a little stuffed frog that she got as a gift that she still sleeps with every night. The Mermaid costume is so creative. That is a lovely costume as well. Thank you for stopping by. Omigosh! This was so hard, but I loved Carmen Cha Cha. I think the colors are fabulous! The Carmen Cha Cha is adorable. It reminds me of a yummy piece of candy - the really sweet ones. Thank you for stopping by. Are there any candles made in the U.S.? Hi, Mary. Great question. I'm surprised I hadn't thought to look for them earlier since my husband fills our home with candles. I found http://www.ebcandles.com. I'll add them to the shopping page. Hopefully, we can help add a job or two to their company. Thanks for asking. Oh that is part of the princess dream gown, isn't it? Thank you for stopping by. I love the Pink Tutu. 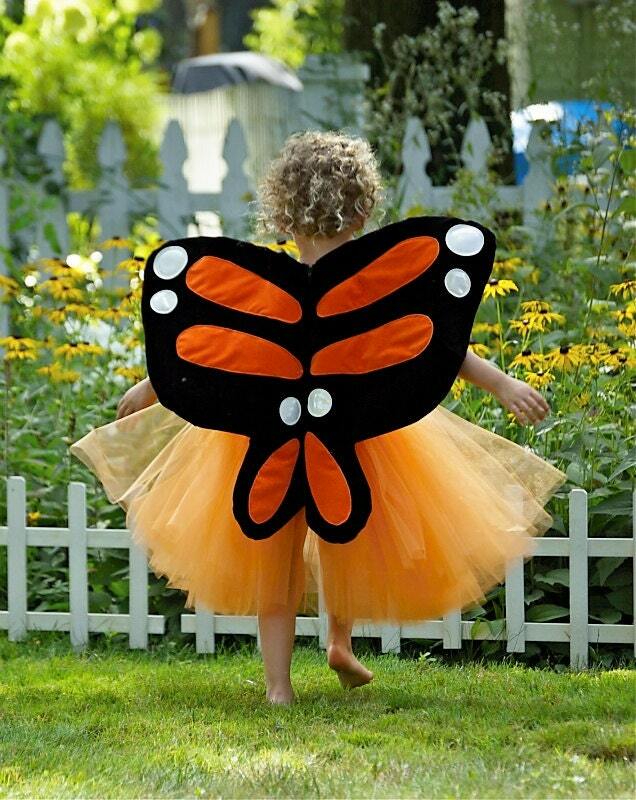 My daughter would probably dance around in it all day. The pink tutu is adorable. Thanks for stopping by. Other than the one you reviewed I also LOVE the Snow White Princess Costume! Precious! It is hard to choose just one. They are both adorable. Thank you for stopping by. One product that I LOVE for your product page that is made in the USA is from the Etsy shop 2 Little Bostons Pet Bakery! I recently tried their Chicken Jerky and my dog went nuts over it! He just loves it and I cannot wait to try more. So hard to find chicken jerky not make in China! So, I was so glad to find their shop and my dog loved their jerky! Thank you for your suggestion and for stopping by. I just an email to get permission to put a link on the Shop page. 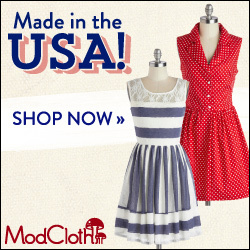 I love hearing from readers about their favorite made in the USA products. I also have a dog so that's even better. Thank you. i love the lion costume... looks comfy too! Thank you for stopping by. The lion costume does look comfy. It looks like it would be warm too for those states where it gets a little cooler at night. As comfy as they look, they could probably make great pajamas during the colder months. Thank you for stopping by. 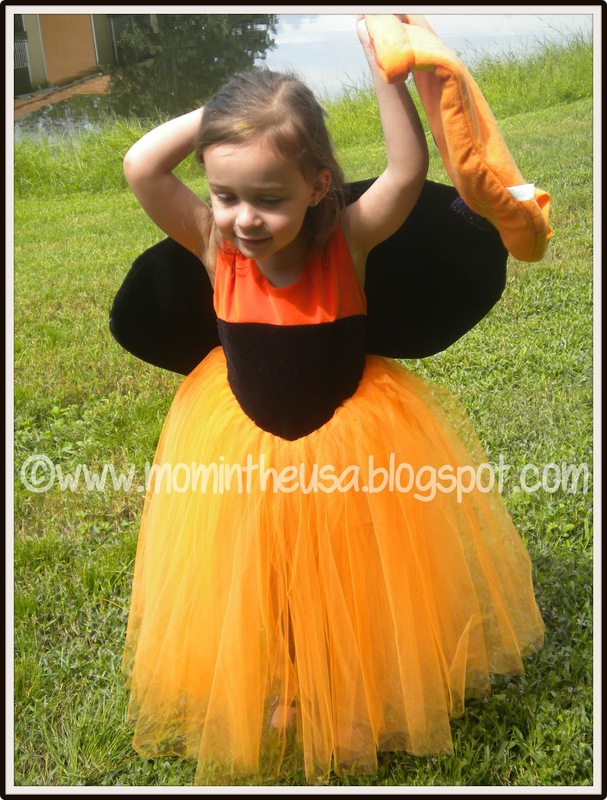 The Buzzing Bee costume is adorable. I'm sure your granddaughter would look amazing in it. I think you could add some fabric, patterns and crafts. Thank you for the suggestion. I have put it on my list of things to find. I'm not crafty so that's probably one that I was avoiding. Maybe what I find will help me become more comfortable doing crafts. The lion costume looks very cuddly. That's another great choice. Thank you for stopping by. Thank you for the suggestion. I stopped by the store. Very cute and original items. I will have the information on Shop-A-Thon Tursday and add the store to the Shop page. Thank you again. Oh that costume is too cute. That's definitely princess-worthy. Thank you for stopping by. I dont really know much about the shop page? when you say item that you would like to add what do you mean? Sorry for the confusion. I have a shopping directory page on the tabs above. It's labeled "Shop!" I was asking you to go to that page and browse around. If there is something that you would like to see that's not there, then please let me know. An example: A previous reader asked about 3D laser gifts and another asked about candles. I hope that helps clear that up.